Want some easy freezer meals without heating up your summertime kitchen? Well, burger up, folks! Today I took the kids down to Balboa Park for a free museum visit. San Diego County residents get free admission to select Balboa Park museums on Tuesdays. We’ve lived here for 5 1/2 years and NEVER done it. I’ve always had the best intentions of course. Of course! But never pulled it off. My husband works most Tuesdays, and I’m a wimp for driving downtown. I know. Hard to believe. I can give birth to six children unmedicated and then homeschool them, but I’m loathe to get on the freeway. Where did that girl who traveled Europe all by herself go, anyway? So, today as we were tooling down Balboa Drive I pointed out to the kids how brave and outside-my-comfort-zone this was. 😉 I wasn’t looking for praise. Rather, I wanted them to know that things aren’t always as easy as they look. If they never know that I am timorous about things, how will they overcome their own hesitations or fears? Anyway, we had a great day, packed a picnic and all that jazz. There were moments when folks were a little hangry, and I was pushing to see all the things before we left for the long walk to the car. But, over all, I call it a success. We will be doing more of this touristy stuff in America’s Finest City. But coming home? Oh we were spent. And dinner prep needed to be quick. While I love freezer cooking, I have to be selective in the recipes and techniques I choose for summer. I don’t always want to heat up the kitchen or have to remember to thaw. That’s where freezing hamburger patties really saves the day. Sometimes I mix in spices, herbs, and onions, like in these Cilantro-Chipotle Cheeseburgers, but often I freeze the patties plain and then season them with a custom spice blend when they go on the grill or in the skillet. This leaves me free to decide what flavors to incorporate into burger night. 1. Form the ground meat into patties. I like to make 1/4 pound patties but you can make them whatever size suits your crowd. If you make a slight impression in the center of each, this will help them not to shrink and bulge up in the center when cooking. 2. 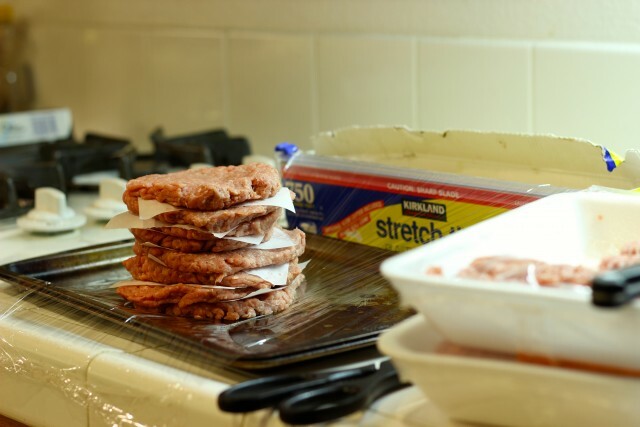 Next, you can bundle the patties, separating them with pieces of parchment paper. Since ours is such a big family, I make bundles of eight, wrapping them tightly in plastic wrap and then placing them in a ziptop freezer bag. Prior to cooking, I allow the patties to thaw. When I have ample time, I do this overnight in the fridge. When I don’t have so much time, I am usually able to pry the partially frozen patties apart and cook from frozen. If you want to make only a few burgers or even just one, you can freeze the patties individually on a tray and then place the frozen patties in a ziptop bag. Having patties already formed in the freezer allows me to custom make my burgers according to size, quality, and meat type. It also saves me precious minutes at supper time. I just heat the grill, cook the patties, and dinner is served. 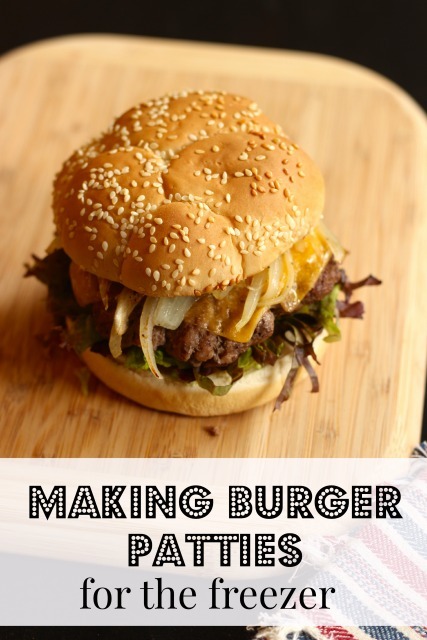 How do YOU make burger making easier at your house? Just last week, I made 8 burgers for the freezer. When forming them, I make them on the thick side, much like Salisbury steak. I used to make burgers whenever we wanted them before I really got into freezer cooking but having them pre made is a much better idea because my husband is great for wanting to grill hamburgers at the last minute and having them on hand saves me from having to run to the store to pick up ground beef and also gives me an easy way out of cooking a big meal inside when the weather is so hot. Because my burgers are thick, I wrap each one individually in plastic wrap and put them in a Tupperware in the freezer. I do that to my family all the time. Ha! 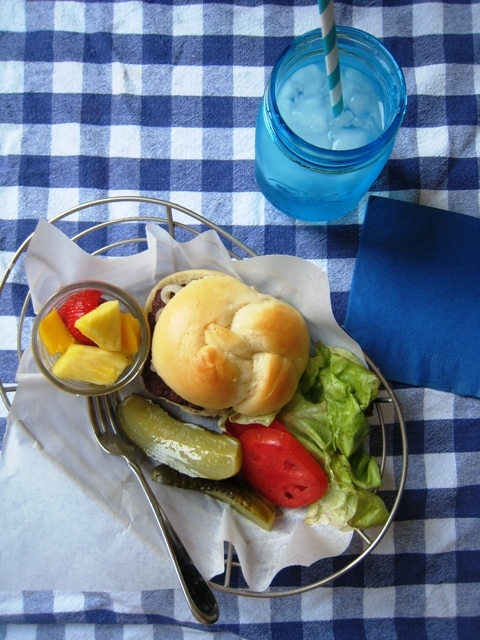 I’ve got about 4 or 5 turkey burgers in the freezer for easy to prepare dinner nights! I do this and it helps so much. I also make several batches of hamburger buns and keep those in the freezer as well. It makes an otherwise somewhat lengthy dinner a super quick one. i don’t usually season my burgers, so thanks for the tip! I can’t seem to access this recipe. Was there one in this blog post or just links to types of burgers to make? This post is primarily about the method to make burgers for the freezer. Sorry for any confusion! So I want to add some extra flavor like onion and mushrooms how does it come out with out cooking the ingredients first. Will the mushrooms cook all the way through when I put the hamburger patties on the grill? I’ve done it with onions in burgers, and used mushroom in meatballs and meatloaf. It should be fine. I always do mushrooms and onions in mine. I put both in my food processor then add to the meat and mix will before shapping snf freezing. I personally do not like mushrooms, but I can barley taste them and they help keep the burgers verry moist while grilling ?? Yes, I like the flavor and texture the mushrooms give to meatballs. Same thing in burgers. Depends on the type of freezer. Good rule of thumb for a side by side would be a month.